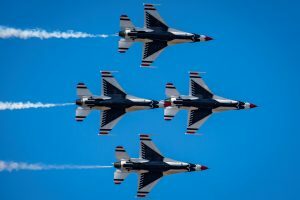 Cleveland will host the U.S. Air Force Thunderbirds as headliners of the 2019 Cleveland National Air Show presented by Discount Drug Mart. Each show day, the six select Thunderbird demonstration pilots will put their distinct red, white and blue F-16 Falcon jet fighters through a choreographed hour-long performance at speeds up to 500 mph and as close as three feet from each other. The demonstration features 40 maneuvers including the trademarked Thunderbird six-plane delta formation, high bomb burst and solo knife-edge pass. The Thunderbirds are the U.S. Air Force “Ambassadors in Blue” and composed of eight pilots (including six demonstration pilots), four support officers, four civilians and 100 enlisted personnel performing more than 30 Air Force specialties. The Thunderbirds represent the United States at approximately thirty-five sites each year. To view the U.S. Air Force Thunderbirds home page click here.